Just two weeks after Intertops opened the new Intertops RED Casino it has already had its first big winner. 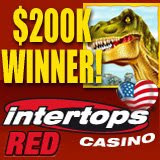 A player known as “Christopher T” won $200,090 playing the T-Rex slot machine. Known for their quick processing, Intertops Red Casino has already started paying the lucky winner. Intertops recently launched its RED Casino on RTG platform in order to continue serving its many loyal American players.